A graveside service for Mary Alice Toole will be held in Oak Hill Cemetery in Talladega, Alabama, on Thursday, November 29, at 2:00. Visitation will be before the service at Usrey Funeral Home, beginning at 12:30. Mary Alice was born on Nov 19, 1928, in Service, Alabama, in Choctaw County. She was the daughter of Wallace Henry Lindsey, of Choctaw County and Annie Laurie Larkin Lindsey, of Brewton, Alabama. She graduated from Sidney Lanier High School in Montgomery and attended the University of Alabama, where she earned a Bachelor of Arts degree in Education. She did post-graduate work at the University of Montevallo and at the University of Mississippi. Mary Alice taught music at Graham Elementary School in Talladega and retired from the Talladega City School system in 1988. 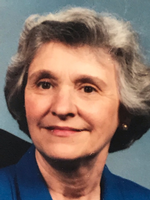 She was a member of St. Peter’s Episcopal Church for over 50 years, at various times serving her church on the vestry, as a Sunday School teacher, choir director, and organist. She also attended the First Presbyterian Church. She was preceded in death by husbands John Dean Fleming, Jr., and Frank McAlpine Toole. She is survived by her daughter, Margaret Lindsey Fleming, her son, John Steven Fleming (Suzanne), stepsons Howard Vandiver Toole and Steven Clarke Toole, grandson Matthew Steven Fleming (Lauren), granddaughter Mary Elizabeth Fleming Brown (Andy) and great-grandson Henry Russell Brown. First Presbyterian Church of Talladega.